Solid design and construction. Above average sound quality. Excellent warranty. Battery life is good. Noise cancelling feature works. Expensive. Need to carry extra batteries around with you. Bass could be a lot tighter. Top end needs some smoothing out. Do not drown out the screams of pissed off passengers well enough. A solid pair of headphones that are easy to travel with, sound good, work as advertised, and have a great money-back guarantee. Excellent headphones for getting stuck on the tarmac at JFK for 10 hours. Just make sure you bring enough batteries. What is it about Bose that gets audio reviewers so upset that we refuse to review their products? For as long as I have been working in the consumer electronics industry, I have been part of a cabal of writers who treat Bose as if they have the plague. On a personal level, I have listened to almost all of the Bose speaker systems and component systems and they are not my thing. Sonically, they do some things quite well, but the tonal balance and presentation does not jive with how I enjoy listening to music. Nothing personal. I know many people who really like the Bose “sound” and I do not feel pompous enough to tell them that they are wrong. One thing I have learned over the years listening to entry-level gear that I thought was great, and some cost-no-object equipment that I found to be less than overwhelming, is that everyone hears things quite differently and that life is excessively short to tell people that they are deaf. One thing one has to admire about Bose is that they do a superb job of marketing their products. They are everywhere, all the time, and the message gets through to people that Bose is #1. Riding the subway in Manhattan one morning was a fascinating exercise, as there were dozens of Bose ads on every train promoting the new TriPort In-Ear headphones. It was impossible to miss them. A quick look across the platform and I counted at least six people using Bose headphones. The noise in the subway is quite deafening, so I was happy to have my Ultimate Ears super-fi 5 Pros with me, which do a great job of noise isolation. As I sat down on the 1 train, I noticed that the man sitting across from me was wearing a pair of Bose QuietComfort 2 noise cancelling headphones. I pointed to my own pair of headphones to see if he was paying attention. My fist turned and I gave him the thumbs up signal. He smiled. Winked. Did the same with his fist. I got off at the next station. 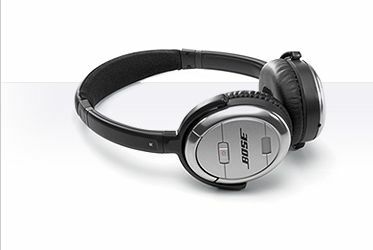 The Bose QuietComfort 2 Acoustic Noise Cancelling headphones feature Bose’s noise cancelling technology, which electronically identifies and reduces noise, while at the same time preserving the acoustic signal. One unique feature about the headphones is that they have different gain settings for in-flight/home stereo systems and another when you are using a laptop, DVD player, or portable media device. There is a very noticeable difference in the volume when you switch between the two. The ear cushions are very soft and comfortable making long listening sessions quite easy on the head/ears. The headphones are light, but I often feel quite sore after listening to other headphones that are sealed. Not so with these. There is real debate among those of us who review headphones about the validity of noise cancelling technology and whether the sound quality suffers as a result. My ears do notice a difference and I am not sure that in all cases, it is a worthwhile trade-off. The original QuietComfort 1 were decent headphones, but something weird was going on with the bass response. The drivers seemed ready to take off on some tracks and never come back down. Fortunately, the problem seems to have been resolved with the QuietComfort 2 and in a very big way. Call me crazy, but I rather enjoyed listening to these. The noise cancelling technology works, although I doubt that it is cutting out as much noise as the manufacturer claims. I sat on the subway listening to these and they did eliminate an adequate amount of external noise. Sonically, I found them to be quite warm and engaging; a characteristic I have never really associated with Bose products. Vocals were fleshed out, without a major loss of detail and everything move along at a decent clip. Bass response was meatier than it was taut, but it was a level of low-level resolution that I could live with. The top end certainly does not have the airiness of the better headphones from Grado, Sennheiser, AKG, or Ultrasone, but its cut-off point makes poor recordings listenable. 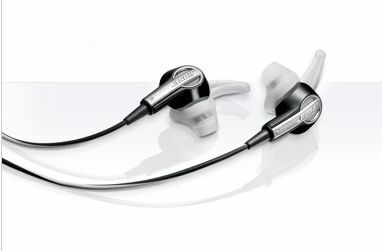 The QuietComfort 2 are not inexpensive, so they have to be judged against headphones in that price range. Would I buy them over the Ultrasone HFI-700 or AKG K 601s? No, but that does preclude a recommendation. The fit and feel is excellent, and they do fold up nicely for travel. I must confess that I was prepared to really hate them. In a weird way, I almost admire them. The luxurious line of Bose Noise reduction headphones at its pinnacle. The noise cancellation is top notch and the audio is full and robust. The fit of these headphones is unmatched. Bose knows how to enhance sound. The price tag is hefty. If the price tag is not an issue. There is no better set of headphones that combines luxury with the highest audio quality period. Bose makes it clear that they are the best at producing the world’s noise reduction audio equipment period. The QuietComfort 15 headset is the marquee headset that shuts out the sounds from all over to enhance the audio coming through the set. The model has been streamlined in the new design and comes with its very own housing case. Bose includes a travel charger to make sure you’re always set to go. There is no rechargeable cell for this one; all you need is a single AA battery to indulge in the best the industry has to offer. Bose stipulates the battery life at 35 hours and the improved noise cancellation ability is top notch. Bose estimates the battery life around 35 hours, but your actual mileage will depend on your usage level and the battery you use. If you’re looking for a headset that will give you exclusive audio coverage on your daily commute, then look no further. With the Bose QuietComfort 15 headset, there is no high frequency noise interruption and these padded phones shut the world completely out. They contend with even the loudest of outside noise distraction. Subways, plane engines and even high pitch sounds like Fire Engines are significantly muted and reduced. The Bose QuietComfort line is the best in the audio industry. They are a favorite by far. Audio quality from Bose’s Quiet Comfort line is the best. The size of the headphones are more compact and streamlined as well. Bose offers a 30 day trail period to experience the Comfort 3 yourself. The battery life cuts offal audio supply and the price is steep. Bose’s new design is ultra-comfortable and more compact than ever before. If you want the premium sound quality, you’ll have to bite the bullet on the price. 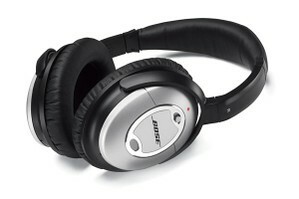 Bose released the third iteration in its QuietComfort series of headphones. When it comes to noise cancelling headphones, I can’t find a better choice. Bose went back to the drawing board and designed a more compact, sleek and streamlined model with the QuietComfort 3 headphones. The design overhaul also includes a new feature. The Whether or not you think they're overpriced, Bose's luxuriously designed QuietComfort models have set the standard for premium noise-canceling headphones. As their model number indicates, the $349 QuietComfort 3s are the third iteration of these popular headphones, and for this go-round, the folks at Bose set out to make a smaller pair of headphones that would sound just as good as the QuietComfort 2s, which remain on the market at $299. The deisn overhaul also inclusedon-the-ear (supra aural) fit is the next level over the circumaural (over the ear) fit. The design doesn’t stop there. These headphones are nothing short of impressive. There is memory foam on the inside of the headphones and the fit is so snug that no sound creeps in or out of the headset. 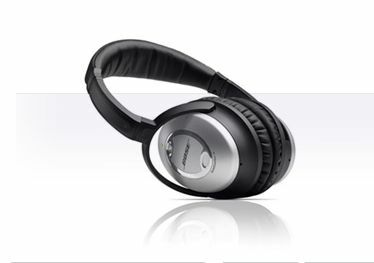 The Bose QuietComfort 3s flat design has a built in noise reducing circuitry. They come with their own little posh carrying case that’s protects the hardware. When you’re travelling by plane there is a two prong adapter and long cord that adds to the overall comfort and convenience. The last part of the Bose redesign is the lithium-ion battery. It comes with a small travel charger to make sure you can plug up where ever you may be. The battery life is approximately 20 hours. You can purchase another battery for $50. The downside is that when your battery life is low a regular AAA cell won’t do the trick for a temporary fix. These ear buds are a great buy and the new design puts them in a class all their own. Bose has set a higher standard for ear phone makers with their latest in ear headphones. The Bose IE2 earphones increase the range of natural sounds. This isn’t your regular $10 ear bud listening experience. The design itself is engineered to enhance the acoustics of sound and the results are smooth audio output, a snug fit and durability. The IE2 ear buds are small and compact but pack a punch. Some larger model earphones can’t measure up to the output quality here. The trademark StayHear silicone tips make sure these earphones keep up with you whatever you may be doing. They come in three different sizes to accommodate different listeners’ ear shape comfortably. 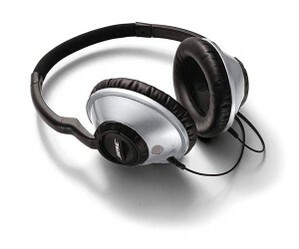 Bose IE2 headphones are compatible with a wide range ofMP3 players, laptops and portable CD players. It comes with a leather carrying case for an element of added style. Bose extended its classic over the ear design to fit the on the go consumer and they couldn’t have done it better. The new design allows people to move about freely but still enjoy the best audio standards of the business. Fairly comfortable and easy to wear for hours. Fairly musical sounding, especially with dance and hip-hop tracks. Fairly coherent across the frequency spectrum making them far less tiring to listen to. 30-day money back guarantee. Not as dynamic sounding as other headphones available at the same price. Can be less than inspiring with certain types of music. Build quality is only above average considering the cost. An above average sounding pair of around-the-ear headphones that do justice to certain recordings, but fail to inspire with others. One could probably do better at this price point with models from Grado, Sennheiser, AKG, and Audio-Technica. Bose TriPort Around-Ear Headphones: Get Your Freaky On!! Dynamic sounding cans that make you groove. Bose? Who would have thought it possible. I have never been a headphone snob. I do not think I even realized that people spent a lot of money on headphones. That they did not steal them off airplanes or grab whatever pair was lying around the bottom of the junk drawer as I did. So it was with hesitation that I took on this assignment. I know a significant amount about music, but I never stopped to contemplate the issue of sound. No more than acknowledging a murky recording or recognizing that the song was flowing unevenly through the wires. I was dissatisfied…just didn't do anything about it. Then a pair of Bose headphones landed on my desk. I plugged them into my iPod and clicked on Delirium's "Truly." It sounded great, like I was dancing at Pascha while the song was in movement around me. Switched to the iPod headphones. Instant disappointment. I was intrigued. Started listening to some of my other favorite dance recordings with the Bose. I was hearing old songs in a very new way. The vocals were chilling, the bass thumping. I Got up and started dancing. Hardly heard the phone as it rang off the hook. I contacted a friend in the audio business. I needed some more information, a push in the right direction as to how one writes a comprehensive review. After speaking to him and brushing up on some of the lingo, I attacked the project with a newfound vigor. I put on Garbage’s "Metal Heart" from their Bleed Like Me album with the Bose headphones. Opening cymbals were hypnotic, but Shirley Manson's voice did not sound as ferocious as it should have. The effect was not as impressive as I had anticipated. I switched over to the iPod headphones. Butch Vig's guitar solo is sharper and the overall sound is not as flat. Only the background vocals and echoing effect are supremely better on the Bose. Akon's "Locked Up" sounds fierce on Bose. I am surprised to discover that it is not so different with the iPod's, except that the beats sound better with the Bose's insulation. The Bose’s top end on Justin Timberlake's "My Love" is far superior. With his high pitch, it is almost offensive on the iPod headphones. The sound is much smoother to me the first time around. Robyn Thicke, has similar vocal abilities as JT, made clear on his collaboration with Lil' Wayne on "Shooter." With the pounding beat and switch-off between rap and vocal verses, the overall feel is much more grooving on the Bose. Somehow with Akon and Garbage, this is not the case, which is a let down because those are two of my favorite songs, which is my feeling somewhat when I switch over to the next recording. Lenny Kravitz's "Minister of Rock and Roll" is a fierce sounding recording. The only viable difference I find between the two headphones is that at the same volume, the Bose create a pleasant, vibrating effect, while the Apple earbuds are far too loud. They scream at you, rather than engage you. The Bose's superiority was the most apparent when I listened to that first dance recording by Delirium. I am willing to venture that for rock and pop music, the iPod headphones are more than adequate, and it is only on more complex dance recordings where the shrill vocals tend to be something that the Bose are better at taming. Would this be reason enough to purchase a pair? Sure, if you are into that kind of music exclusively. Otherwise, they might not be worth the extra money or room they take up.